Nobody was hurt, and I am fine! I am in perfect physical and almost mental condition, but I am going to share with you my last experience in Singapore: my Singaporean Emergency Unit experience. Ah yes, ... I was saying that it was almost 10AM when I realized that it was about time to move faster and change gear. In my attempt to multitask, calling a cab while putting my left sock on (try at home on your bed, and see if you could do it, before laughing), I tripped over my sneaker, and ended up kicking the side of the open wooden door. Why my sneaker was in the middle of my way out to the cabby, or why did the wooden door kicked my right foot are still mysteries for me, but the bottom line was my right foot was hurting, the cabby was waiting for me downstairs, and the wooden door was still intact. The first 10 minutes of my meeting was very much entirely distracted by the breakfast fighting given by my interviewer, but the following 30 minutes were concentrated on mentally checking the size of my foot. A quick ending of the discussion, hopeless promises and hand shaking were the only thing that I can remember from the meeting aftermath. Back home, I crashed on my bed, liberated my pain from my shoe and contemplated my right foot. The wooden door was still intact and my foot had a normal size. The rest of the day was just an endless excuse to continue doing what I am becoming good at: virtual interaction with people online for no purpose, with a foot in the air. At night, after telling my story to J., I promised her to see a doctor the next day to confirm that my right foot was not broken. I accepted resentfully to first ease her worries (Better safe than "story") and to second, have a new distraction in my boring and uneventful life. So here I am, calling a cab, next morning (Thursday), to the Alexandra Hospital. The choice of this hospital is quite simple. This is the only hospital that we know of since this is where we did our medical checkup for the one year residency permit. I arrived at the Emergency room, and beside a Chinese grand-pa, and a young lady with limited mobility, the room was empty. The number 50 was allocated to me (don’t tell me that they already had 50 cases), and I was send back to my seat with a plastic folder including stickers with my name on them, a customer survey, and without the S$60 form the consultation. In a Tropical Emergency service, you pay before being serviced. 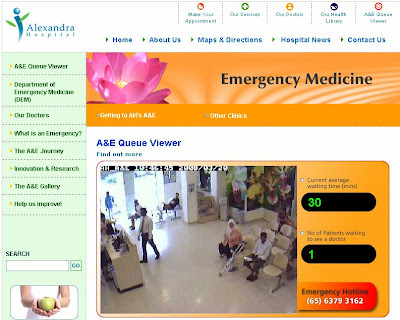 The Alexandra Hospital, tagged itself to follow best practices from other organizations and to deliver effective and efficient quality services. 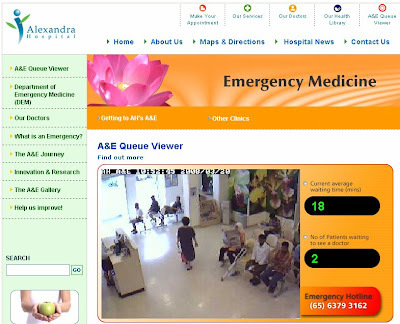 One of these effective and efficient quality services is the almost real time webcam of the A&E (Accident & Emergency) department. As soon as I got in the room, I SMS-ed J. at work to find out if she was able to see me online. She followed me in my Tropical Emergency unit experience. 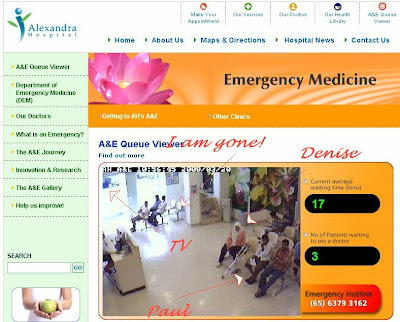 Beside, asking friends to screen shoot you when at the hospital to make a blog entry I do not see the real purpose of having a webcam, refreshed every 5 minutes, in an Emergency Unit. Because to be frank with you, if you need to go the emergency, you are not going to check online if the queue is 45 minutes long, you are just hoping that they will treat your case as fast as possible and maybe save your life! Anyway, I was at the Emergency for an X-ray, and I was going to be taking care of, my profile was in the “process” to be treated. As you can see, the person before me was taking his time (30 minutes average time for a Chinese Grand-Pa, I guess), but your humble Blogger was next on the list. In the meantime, I was investigating my surrounding, and discover very interesting signs around me. The one that stuck me the most was probably the larger one stating that your case will be treated according to the queue line up, unless your life depends on it. I felt automatically relieved, and I was happy to discover that even in a strong Process State as Singapore, your life threatening state could bypass you few seats in the line. This is the way to squeeze the process, and take advantage of the matrix. When I was watching the new Chinese morning soap opera, a triangle love story on a construction site, between the second Architect in command (Ms Kim), the previous leading Architect (Mr. Jong) who want to follow his heart oversea, and the Master (Mr. Master) bleached headed with a very profound philosophy (“He will be back, they always come back”), my number was called. I went to the booth number 1 to have my profile taken, answer few questions, and having my blood pressure done. When she asked me what was the purpose of my visit today to the Hospital, I told her my door story and asked for an X-Ray. She did not answer my request and pushed back in a conversation ending tone: “later you will see the doctor”. My only benefit from my interaction from her was the fact that I was diagnosed as a Male, speaking some sort of English, and was upgraded to Indian! Even now I don’t think that being Indian would have solved or either was the cause of my right foot injury, but you have to accept the truth judgment from a competent medical body. She was maybe right and saw through me, I might be Indian … deep, deep, ... deep inside. Still shocked by this revealing information, she asked me to seat back to my place and wait to see the doctor as soon as my number 50 would be called on the board. I was at the crucial point where the cousin of Mr. Jong, the leading architect, was playing violin outside a close wooden door (not mine, mine was open, not closed), when 20 minutes later, my number was called, and assign to booth number 2. Booth number 1 and 2 were in the same room, but divided by a paper wall. I was surprise to see the same lady with a mask that time at the desk. She asked me the same question, and took again my blood pressure. 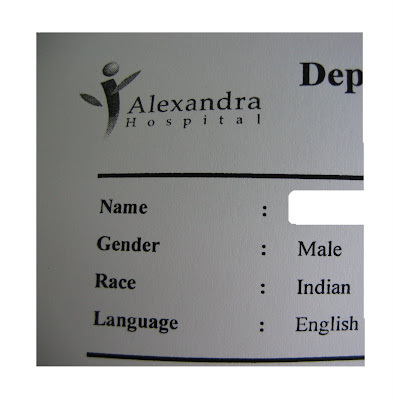 The good news were, I was confirmed to be Indian, Male, English speaking having still 125 (never heard such a number) as blood pressure measure. I told her again the same story and she asked me to see her colleague next desk for a further and more detail diagnosis. I moved to the next desk, 3 feet away, and told the new masked lady that I kick an open wooden door, and I wanted to make sure that I had nothing broken, and an X-Ray might be the best option for me, although I am no doctor, and I wished not to tell her what to do. For the third times, she took my blood pressure, and confirmed me that I would see the doctor soon. On my way back to my seat, I was scared that I could spend the entire day balancing from one staff member to another in this pretty big hospital, promised to be sent to see a doctor soon, while having my arm in pain with a 5 minute refreshed blood pressure, displayed online with a new webcam they would implanted soon. In a Tropical Emergency service, you have to pass human lie detector tests before seeing a doctor. Thankfully, Ms Kim, the second in command, after a fight with the ex-leading Architect, was now promoted to be in charge of the whole construction site. She was having an after hour refreshment when she opened up to her best friend. She was confused and did not understand “why the leading architect quit so close to be at the pinnacle of his career.” Her best friend told her that one have many pinnacles in life. One can pursue his or her Love pinnacle, or Friend pinnacle instead of his or her Career pinnacles …. Number 50 was flashing in front of the booth 3: I am going to finally see the Doctor! I rapidly, as fast as I could, limped to the room, and was asked to be seat by a young professional. He asked me the same questions as the 2 ladies before, but I knew the answer thanks to the rehearsals I had before. He told me that he could do nothing for me, unless he had an X-Ray, and asked me why I had not brought him an X-ray. “No, I did not know I needed an X-Ray” was my almost honest answer. Some of you would have jumped on the guy and probably beaten him while insulted him and all his family including uncles and cousins, but as a new Indian I wanted to handle the thing in a more positive way, plus I know by experience that fighting the process in Singapore will go nowhere. He sent me to the X-Ray room 2, booth 1. I shuffled my way to the other side of the hallway, next door actually, and patiently waited that my name would be called soon. Ms Kim was still on TV and she was enjoying herself at a very lively dinner with her family and friends. Could not read the subtitles from the back of the room, but I am sure that she was doing fine in her new pinnacle in friendship. The whole family was laughing loud all the 15 minutes of my waiting time. When my name was finally called, I was surprised that my neighbor also decided to stand up and walked to the X-Ray room. I did not know that I had an old Chinese homonym on the island, and I was ready to engage in a lively tree genealogy discussion with him when he was sent back by the masked lady who was guarding the front door of the X-Ray engine. She probably recognized that he was not Indian, and sent him back to his seat although we had the same name. On my way to the room, I had to step back for a minute or so and let pass an emergency case. The young man was handcuffed both wrists to his gurney, and had a hard time to sign the large pile of paper he had in front of him. I have to say that the 3 policemen around him did not help to reduce the stress he was experiencing in his will writing. This is not the first time that I see handcuffed people around me in public places on display for prevention and order reinforcement. In a Tropical Emergency service, you get serviced faster if you are handcuffed. He went back to his booth 2 in the room 3, and sent his assistant with my unwanted pills paper. I really wanted to see how I was looking on my X-Ray, and see if my right foot profile was better than my left one. I asked the assistant if I could see my X-Ray picture. So, she asked her boss if I could see the X-Ray, but both of them were extremely confused. That was an unusual question from an Indian-Male-English speaking. Why on earth would someone see an X-Ray? I backed off, scared to be handcuffed myself and to have to sign the same huge pile of paper the young kid had to sign to see his X-Ray. I limped to the pharmacy for my prescription to be delivered (S$ 1.20) and jumped in the next available taxi (S$ 8.30). The entire journey took me over 3 hours and I did not had a chance to see my X-Ray, the thing I went to the hospital for in the first place. The worse thing is not that the wooden door was still open when I came back, but I really don‘t know if Ms. Kim, the newly appointed architect, kissed Mr. Jong the previous leading Architect. I would appreciate it if someone could tell me the end of the Chinese soap-opera. I might go back tomorrow to see the end of the TV show anyway.